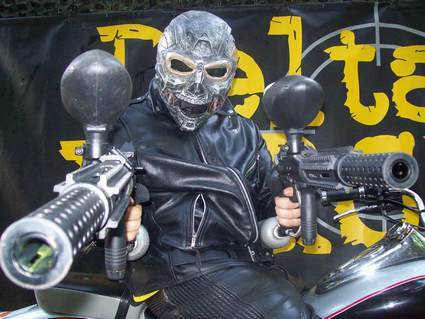 Paintballing in Warrington with Delta Force – the ultimate adventure! For those looking for the ultimate outdoor adventure in Warrington, try paintballing at Delta Force Paintball Manchester. Our paintball centre near Warrington provides both adults and children with the ultimate outdoor adventure activity with a fantastic range of paintball game zones with Hollywood style props and this centre has proved a popular choice for paintball fans living in Warrington! 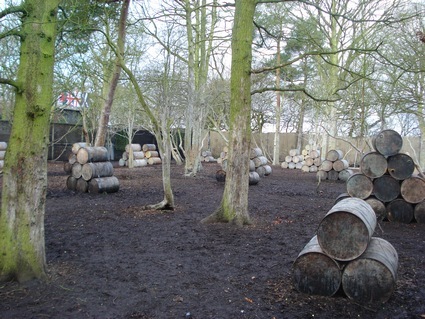 Located just off the M6 motorway at Junction 17, our Manchester paintball centre features themed game scenarios such as Command Post which is set in the empty hills of Afghanistan, Chemical Alley where your task is to take control of a heavily guarded fuel depot, A Bridge Too Far where allied forces have sent a large number of paratroopers into the Netherlands, Mad Murphy’s Jungle Attack which is set in a deep, dark rainforest, Viet Cong Village where lots of hostile villagers live and The Haunted Graveyard which features creepy looking tombstones for players to take shelter behind. However, Warrington paintball players be warned…your enemies aren’t the only threat that lurks in the woods; you’ll have to be watchful of the Delta Force Paintball Terminator! Armed with his deadly BT4 combat painball guns, the rogue cybernetcic assassain can turn up in any game at any point without warning! He’ll be looking for a worthy oponent to take on; if that happens to be you, he’ll raise his guns and point them in your direction. To accept his challenge, all you need to do is open fire at him and take him on, one-to-one! And, if he decides you’re commendable, he’ll give up one of his awesome guns for you to use for the remainder of the game. The 0.68 calibre semi-automatic paintball guns feature a lightweight frame and can fire up to 13 paintballs every second! So, if you want to get your hands on one of these impressive guns, you’ll need to keep an eye out for the Delta Force Paintball Terminator! For more information about paintballing Warrington with Delta Force Paintball Manchester or to book a day of paintball with us, dial 0203 869 9301 and speak to a member of the team who will be happy to help you.